For all languages, the formatter wraps lines at the right margin at least in some situations. If you don't want the wrapping to happen, you need to increase the right margin so that it is not exceeded by your code. I found in 2.7.1 that I have to do exactly this to prevent wrapping when I paste blocks of code now. I like having the margin set to 80 as a mental guideline rather than having pycharm wrap for me. In prior versions, Pycharm did not wrap the line on reformatting. It looks like reformat wrapping is being enforced regardless of settings. I'm taking a leap here and going to assume the following ticket applies to this issue as well. I stumbled on an interesting fact. 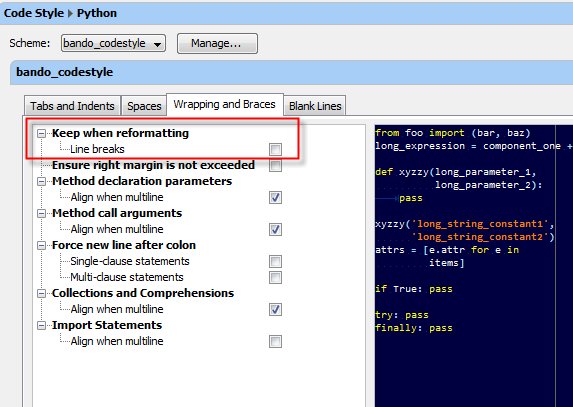 Having 'Smart indent pasted lines' disabled when pasting code which exceeds the margin would not result in a forced reformatting of that code. In other words, turning this option off fixes the problem of pasted code reformatting beyond the right margin. This setting already has an issue with it where pasting causes extra whitespace (tabs) to appear after the pasted code. I'm beginning to wonder if these two bugs aren't somehow related. If yours is enabled, perhaps you would be willing to test turning it off to confirm my finding? Marcel – very much appreciate your attempts to solve this. I spent some more time fiddling with settings, attempting to understand what is controlling the behavior I'm seeing, but unfortunately I'm still not understanding. I tried turning off 'smart indent pasted lines' and can confirm that a pasted long line will not break with it off, whereas it will with it on – but of course then I lose the smart indent as well! I thought I'd share my findings since last time. I've updated to 3.1 (#PY-133.804) and found the issue I mentioned with Smart Indent is fixed, however there still appears to be an issue with pasting longer lines beyond the margin. I had secretly hoped that fixing one would fix the other but that does not appear to be the case. The thing I found which I think is worth mentioning is only certain items appear to want to wrap. This long line will not wrap no matter where I paste it. However, the following line with a few str() calls in it and suddenly things start wrapping. The weird thing is where the wrap occurs. Notice the wrap inside the function. It did not wrap at 80 characters (which is where my margin is set to). It wrapped at 126 characters. I haven't figured out the pattern yet, but it's particularly odd. If I change the margin to 90 chars the wrap position changes as well. Some settings to note that may be factors which I have not determined yet. Smart indent pasted lines is enabled. Turning off "smart indent" turns off the wrapping behavior altogether (as was found in 2.7.3), but as Kim stated above this is not ideal since pasting sections of code without having to reformat the indentation is really convenient. I will post the link to this post in http://youtrack.jetbrains.com/issue/PY-4664. If any part of the the call for str() – which occurs between the parens – lands on the margin it will cause a wrap. I then played with a few code style settings and found when I disable 'Keep when formatting'> 'Line breaks'. The wrapping doesn't occur anymore. EDIT: spoke too soon. It still occurs but it just moves where the wrap happens. I'm so confused by where the wrap wants to happen.